Grifter - Telepath, carries guns and other weapons. Godiva - No abilities shown. Canterbury Cricket - Flight with Wings, Supersonic sound wave. Etrigan The Demon - Surrounded by energy, Flight. Hyde - Human who turns into Hulk like Hyde creature. This issue begins with resistance members Grifter, Godiva, Canterbury Cricket, Etrigan, and Hyde being chased through the London Underground subway system by Hawkgirl and the rest of an Amazonian kill-team. Grifter is named by an Amazon as the leader of the resistance during the fight and against the odds the resistance brutally kills the kill-team. This fight sequence ends with Grifter plunging a knife into Hawkgirl's chest. The resistance team continues to make their way through the subway system to a currently unknown destination. Grifter narrates that he never asked to lead the resistance, he is expecting to meet with Penny Black, and that the Amazons are on high alert. They come across Lois Lane in the tunnels and make her prove that she isn't an enemy before they bring their guard down. Lois shows them a message from Penny recorded and played back on the device Cyborg gave Jimmy in issue one. Lois recounts the escape from the Amazons from the end of issue one, and she says that Penny was amazing in the escape. Grifter explains that he knows just how amazing Penny is and we see a flashback for the next couple pages. Grifter is leading a team consisting of Sarge Rock, Lt Reid, Lady Blackhawk, John Stewart, Kate Kane and Gunner against Jihadist strong holds in Afghanistan and things go sour. We see Grifter on the ground with multiple barrels aiming at him when out of no where Penny Black shows up wearing a "Technopathic Britannia Weapon Suit". She dispatches the Jihadist force with ease and rescues Grifter. Grifter shares that he is a telepath and when his ability is close to Penny's technopathy there is a spark, a connection. It's easy to see that he is smitten, and he admits as much. Fast forward to the day the Amazons attack and Grifter goes on about how he pulled together a resistance cell out of a bunch of misfits. While they are on attacking an Amazon prison hulk (Looks like a giant old wooden sailboat) he can sense Penny nearby and he rescues her from the brig. She no longer had her suit, but she still had technology built into her we learn later. Grifter narrates that ever since the day they freed Penny, they have been searching for the next generation Britannia armor prototype that Penny knows the Navy secured somewhere. The resistance team arrives at a safe house in which they punch a secret code into a keypad to enter and they find Penny in a sling. She says she is doing fine other than the Amazonian arrow she recently had in her shoulder. Lois attempts to message Cyborg when Penny gets a physical reaction from Cyborg's "ultra-advanced" tech. After just a few seconds of manipulating the device, Penny learns where the experimental suit is hidden. Shortly after this the team is then shown heading across the Thames in Zodiac boats. When they arrive at a main drain outfall Etrigan and the Cricket go in to scout. Etrigan is dropped by an arrow and the resistance is faced with a group of Amazonians. Grifter asks how they could have possibly found out, and Hyde (still in human form) says she told the Amazons. Hyde explains that she hates being Hyde and the Amazons offered her a cure as she holds a knife to Lois' neck. She demands the resistance surrender or she will slit Lois' throat. Story - 3: Like the main Flashpoint story line this story is all over the place. I feel like this comic does a better job of managing the time line juggling but on the first read through it is chaotic. That's not the say this isn't a good story, it is. I don't think that this is the writer's fault, these guys just have to give us an entire unknown universe's story in a few comics. Much like the rest of the Flashpoint tie-ins I think I know what to expect and I don't get anything close to that. This is a solid story, it just took me a second read through to figure out exactly how everything fits together. One gripe is that after they find Lois, I didn't know if they were going somewhere in particular or just wandering through the subway - that was probably the point where I was the most confused. Art - 4: I enjoyed the art in #2 much more than #1. We have a different artist in this one and the characters look great in most frames. The environments were lacking though, and I'm not just talking about the sewers. The cityscapes were not very detailed, but with all the flashbacks and changes of scenery it was probably pretty hard to put it all together. 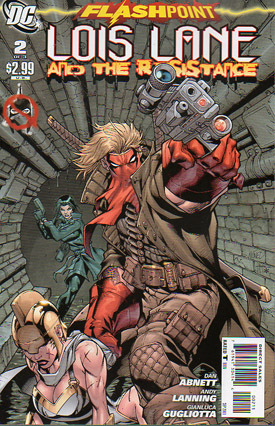 Cover Art - 3: Grifter is very well detailed and the cover conveys that he will be the star of the show. This rating loses a point probably just based on the fact it is in a sewer. I never have liked sewer scenes movies, comics or games.